Grew up with songs like Addicted, Welcome to My Life and Perfect? I am sure these songs are familiar if you are a fan of Simple Plan! Growing up these were the songs that I listened to whenever I was emotional. Till now, this song helps whenever I am feeling down or angry. The band has just released a new album, Taking One for the Team. In conjunction with the album, they are doing a tour and Singapore is part of their South-East Asia Tour. The band was last here for a concert back in 2012 and I attended it. Awesome showmanship and fan service! 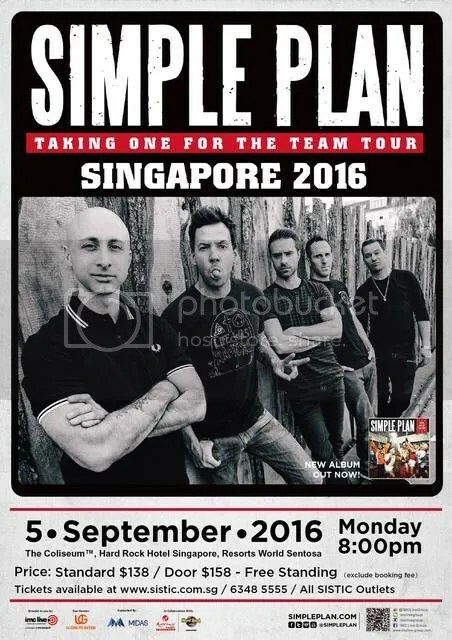 Do not miss your chance to relive your growing up years with Simple Plan. Tickets will be on sale from Tuesday, July 5 on all SISTIC outlets!